• For quantitative determination of glycogen and evaluation of drug effects on glycogen metabolism. • Use as little as 10 μL samples. Linear detection range: 2 to 200 μg/mL glycogen for colorimetric assays and 0.2 to 20 μg/mL for fluorimetric assays. • GLYCOGEN is a branched polysaccharide of glucose units linked by α-1,4 glycosidic bonds and α-1,6 glycosidic bonds. It is stored primarily in the liver and muscle, and forms an energy reserve that can be quickly mobilized to meet a sudden need for glucose. The most common glycogen metabolism disorder is found in diabetes, in which, due to abnormal amounts of insulin, liver glycogen can be abnormally accumulated or depleted. Genetic glycogen storage diseases have been associated with various inborn errors of metabolism caused by deficiencies of enzymes necessary for glycogen synthesis or breakdown. Simple, direct and automation-ready procedures for measuring glycogen concentrations find wide applications in research and drug discovery. BioAssay Systems glycogen assay uses a single Working Reagent that combines the enzymatic break down of glycogen and the detection of glucose in one step. The color intensity of the reaction product at 570nm or fluorescence intensity at λex/em = 530/585 nm is directly proportional to the glycogen concentration in the sample. This simple convenient assay is carried out at room temperature and takes only 30 min. 1. How to prepare cell samples for the glycogen assay? We recommend a modified version of the protocol used by Murat & Serfaty (Clin Chem. 12:1576-7). - Homogenize 10x6 cells with 200 ?l buffer (0.025 M citrate, pH 4.2, 2.5 g/L NaF) on ice. - Centrifuge sample at 14,000 x g for 5 min to remove debris, and use 10 ?L of the clear supernatant in the assay. - I would also recommend diluting the standard in this buffer rather than distilled water to increase the accuracy of the assay. Tissue preparation: 10 to 30 mg/mL tissue in 0.025 M citrate, pH4.2, 2.5 g/L NaF. 2. I obtained a very high glycogen concentration after homogenizing mouse liver tissue in a sucrose/EDTA buffer. Indeed, the amount of glycogen was higher than the amount of liver tissue I added. A sample blank (without enzyme A) showed there is only a small amount of glucose in the sample. What could cause these results? One of the enzymes in ?enzyme A?, transglucosidase hydrolyzes sucrose into glucose and fructose. 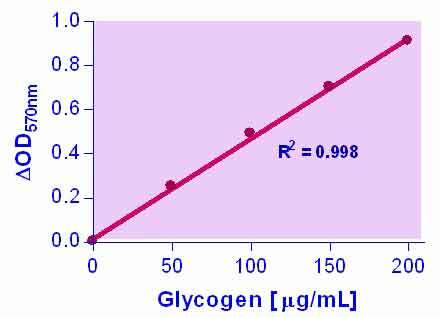 You are actually measuring the amount of buffer rather than the amount of glycogen in your sample. We recommend using a sucrose free buffer, e.g. (0.025 M citrate, pH4.2, 2.5 g/L NaF). 1. Yin, M et al (2011). Metformin improves cardiac function in a nondiabetic rat model of post-MI heart failure. Am J Physiol Heart Circ Physiol 301(2):H459-68. Assay: Glycogen in Rat Cardiac muscle (Pubmed). 2. Iwabuchi S, Kawahara K (2011). Inducible astrocytic glucose transporter-3 contributes to the enhanced storage of intracellular glycogen during reperfusion after ischemia. Neurochem Int 59(2):319-25. Assay: Glycogen in Rat Astrocytes (Pubmed). 3. Primassin, S., S. Tucci, et al. (2011). "Hepatic and muscular effects of different dietary fat content in VLCAD deficient mice." Mol Genet Metab 104(4): 546-51. Assay: Glycogen in Mouse Muscle, Liver (Pubmed).